On November 22, 2008, The Foundation for the Preservation and Advancement of Bridge (FPAB) became the caretaker of the largest collection of trump indicators in the United States. 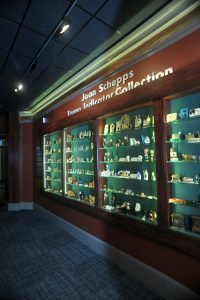 The collection, generously donated by Joan and Elihu Schepps, is comprised of over 650 pieces and is now on display in the American Contract Bridge League Museum. 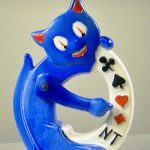 A trump indicator is a device that was used in the game of whist, and later in bridge. In whist, there was no bidding to determine the trump suit; trump was determined by turning the 52nd card up at the conclusion of the deal. Due to the arbitrary selection of trump, it was easily forgotten. These devices were placed on the table as a reminder for the players. Trump indicators are made from a variety of materials and incorporate a wide range of additional subject matter. 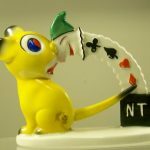 There are porcelain clowns, wooden cartoon characters, celluloid cats, metal monkeys, and virtually any other combination of material and form one could imagine. However, the thing that all trump indicators have in common is they always display the four suit symbols: spades, hearts, diamonds, and clubs. Some trump indicators have a designation for No Trump and all have a mechanism that moves in order to indicate the trump suit. These devices date primarily from the late 1800s to the early 1930s. It is rare to find a trump indicator that indicates when, where, and by whom it was made. The material can narrow the time frame, for instance, bakelite did not come into existence until 1910 and was popularly used in the ’20s. Porcelain pieces are sometimes stamped with lot numbers and a country of origin. Sterling silver pieces can be identified in many cases by a maker’s mark. Another clue to dating trump indicators is simply in the design: Victorian, Art Deco, Folk Art, or a popular character like Betty Boop. 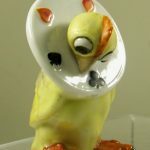 The flagship piece in this collection is a four inch porcelain chicken in a clown collar. The chicken’s head rotates around to indicate the trump suits located on its collar. Neither Mrs. Schepps nor the seller had any idea what the item was, but it proved to be too fascinating to resist. It wasn’t until the purchase of Mrs. Schepps third indicator that she found out what these pieces were called. Mrs. Schepps has since become an authority on the subject. There are several trump indicators made by well known companies, such as Goebel, Wade, and Royal Doulton. The four indicators produced by the Goebel Company are included in the Schepps Collection. The first one was Sitting Cat sculpted by Karl Simon in 1927. 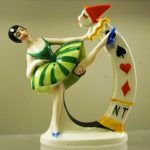 The other three (Dancing Pierrot, Ballerina, and Mouse) were sculpted by Rheinhold Unger in 1928. Goebel discontinued the pieces in 1936. 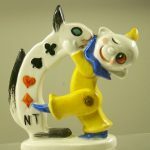 Royal Doulton produced one trump indicator, a porcelain gnome, from 1910-1920. This piece is also included in the collection. Whether the origin of the trump indicator is known or not, these pieces appeal on many levels. Each piece can be appreciated for the work of art that it is, the creative way in which it functions, and for the link to the past it provides. These pieces are reminders of where the game we love started and of simpler times filled with cards, friends, and family. The next time you are in the Memphis area, we invite you to make plans to stop by and see this wonderful collection. The permanent display is at 6575 Windchase Drive, Horn Lake, MS 38637.